Journey Bytes WhatsApp What is the Private Folder inside WhatsApp Media Folders? The private folder is part of a new feature in WhatsApp that allows users to hide media downloaded from all or specific chats from the gallery. These includes images, videos, gifs, audio files and documents. This feature was previously only available to those using WhatsApp Beta but it's now available on the stable release. How does the Private Folder hide Media? Images and videos stored in the private folders are not visible in the gallery. They're instead hidden by a .nomedia file that is usually hidden. You can view it by making hidden files visible in your file manager's settings. The .nomedia file hides the media by instructing Android's media scanner to skip folders where its found when finding new images and videos to add to the gallery. As such, if you delete this file the media will no longer be hidden. This is however not restricted to the default gallery and will as well hide the media for other gallery apps. The only exception is if an app has a setting to ignore .nomedia files e.g. MX Player for videos. In the case of audio files, the .nomedia file will hide them from the stock Music app as well as other music players. 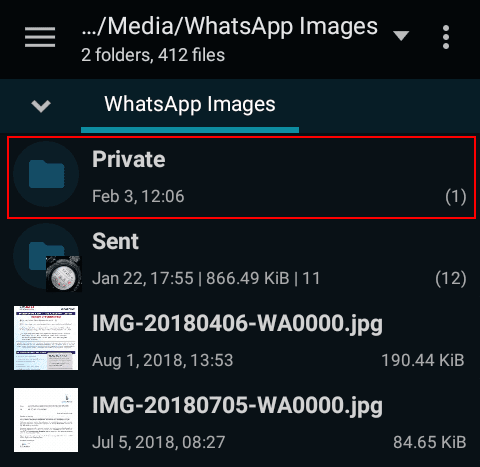 How to Enable the WhatsApp Private Folder? The private folders will be created the moment you update to the latest WhatsApp for Android. To use them you'll however have to enable the setting to hide media either for all chats or specific individual and group chats. However, only the newly downloaded media in your chats will be hidden when either of these settings is enabled. 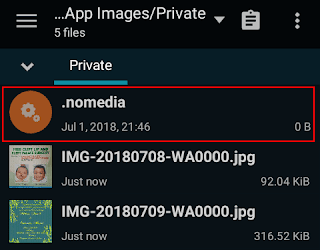 To hide any of the old media that had already been downloaded from the gallery, you'll have move the images or videos manually to the private folders using a file manager. Likewise, if you need to make the hidden images and videos visible in the gallery you'll have to move them manually out of the private folder. For only newly downloaded media, just disable the media visibility setting.